X Photosynthesis occurs across its body under the sun. The shell on its back is actually hardened soil. X Im Sonnenlicht betreibt sein ganzer Körper Photosynthese. Sein Panzer besteht aus hartem Lehm. X Son corps assimile la lumière du soleil par photosynthèse. Sa carapace est faite de terre durcie. X Realiza la fotosíntesis al bañarle los rayos de sol. Su concha está formada por tierra endurecida. X Fa la fotosintesi su tutto il corpo esponendosi ai raggi solari. La sua corazza è fatta di terra compatta. X 태양의 빛을 쬐어 전신으로 광합성을 한다. 등껍질은 흙이 딱딱해진 것이다. Y It undertakes photosynthesis with its body, making oxygen. The leaf on its head wilts if it is thirsty. Y Sein Körper lebt von der Photosynthese, die Sauerstoff freisetzt. Ist es durstig, welkt sein Blatt. Y Son corps produit de l’oxygène par photosynthèse. La feuille sur sa tête flétrit quand il a soif. Y Realiza la fotosíntesis para obtener oxígeno. Si tiene sed, las hojas de la cabeza se marchitan. Y È in grado di svolgere la fotosintesi e di produrre ossigeno. La sua foglia appassisce se ha sete. Y 전신으로 광합성을 하여 산소를 만든다. 목이 마르면 머리의 잎사귀가 시들어 버린다. Omega Ruby It undertakes photosynthesis with its body, making oxygen. The leaf on its head wilts if it is thirsty. Omega Ruby Sein Körper lebt von der Photosynthese, die Sauerstoff freisetzt. Ist es durstig, welkt sein Blatt. Omega Ruby Son corps produit de l’oxygène par photosynthèse. La feuille sur sa tête flétrit quand il a soif. Omega Ruby Realiza la fotosíntesis para obtener oxígeno. Si tiene sed, las hojas de la cabeza se marchitan. Omega Ruby È in grado di svolgere la fotosintesi e di produrre ossigeno. La sua foglia appassisce se ha sete. Omega Ruby 전신으로 광합성을 하여 산소를 만든다. 목이 마르면 머리의 잎사귀가 시들어 버린다. Alpha Sapphire Photosynthesis occurs across its body under the sun. The shell on its back is actually hardened soil. Alpha Sapphire Im Sonnenlicht betreibt sein ganzer Körper Photosynthese. Sein Panzer besteht aus hartem Lehm. Alpha Sapphire Son corps assimile la lumière du soleil par photosynthèse. Sa carapace est faite de terre durcie. Alpha Sapphire Realiza la fotosíntesis al bañarle los rayos de sol. Su concha está formada por tierra endurecida. Alpha Sapphire Fa la fotosintesi su tutto il corpo esponendosi ai raggi solari. La sua corazza è fatta di terra compatta. Alpha Sapphire 태양의 빛을 쬐어 전신으로 광합성을 한다. 등껍질은 흙이 딱딱해진 것이다. Diamond The shell on its back, which is made of soil, grows even stronger when it absorbs water. It lives in areas that are close to lakes. Pearl It makes oxygen by carrying out photosynthesis with its whole body. The leaf on its head will wilt if it becomes thirsty. Platinum The shell on its back is made of soil. On a very healthy TURTWIG, the shell should feel moist. SoulSilver Photosynthesis occurs across its body under the sun. The shell on its back is actually hardened soil. Black The shell on its back is made of soil. 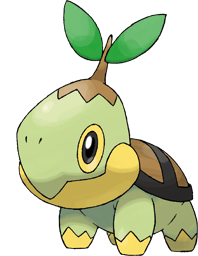 On a very healthy Turtwig, the shell should feel moist. White The shell on its back is made of soil. On a very healthy Turtwig, the shell should feel moist. White 2 The shell on its back is made of soil. 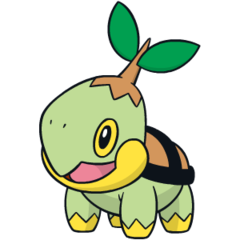 On a very healthy Turtwig, the shell should feel moist.